The most mysterious element to the ongoing Canadian Football League labour talks is the question of how the rosters will have to adjust to accommodate the incoming recruitment of players from around world. In what has been tabbed CFL 2.0 by commissioner Randy Ambrosie, the league sees a future with players from countries like Mexico, Germany, Italy and France playing in the league. The idea is to diversify the league with an international flavour, in the hopes of creating broadcast audiences in the countries these players come from. In January, the CFL held a combine and draft in Mexico City. This upcoming weekend's annual CFL Combine for draft-eligible Canadian players in Toronto will include 18 European players who've been invited to participate. But what no one understands yet – and what must be determined during the current CBA talks – is how these players will get onto a roster and how they will fit in with the CFL’s current ratio of Canadians to Americans. Will they have to earn their way onto the field or will they have starting spots designated for them? How do you make that work without someone surrendering some precious ground, like the 21 roster spots presently dedicated exclusively for Canadians? These are complicated questions with difficult answers. Surely you can’t add such a dynamic element to your sport without there being some significant changes to the construction of rosters. But it’s important that the league gets this right so that the integration of international players doesn’t disturb the integrity of the sport. So here’s a solution that would make sense and allow international players to become part of the CFL when they are ready to do so, without drastically changing the role of Canadians in the game. The CFL should drop the minimum number of Canadians on every team from 21 to 15, opening up six spots on every roster for which global players can compete. The reality is Canadians would retain most of those spots. But if a player from Germany or France can legitimately beat out a Canadian for one of those six spots, he should be on the roster. If there are no global players worthy of beating out Canadians, then the number of Canadians on every team would remain the same – 21. But this roster tweak opens the door for global players to be part of the CFL when they are ready and allows Canadians to compete to keep their jobs. The requirement for seven Canadian starters per team should be changed to Canadian or global players, giving players from around the world the same opportunity to start that Canadians have, providing they are good enough to be on a roster. Teams would have an incentive to identify and develop talent from around the world as there would be significant value in a global player who is good enough to start. There have been suggestions that the league could mandate that two of the seven starting Canadian roles must go to global players. But such a move, were it implemented right away, would result in 18 starters across the league’s nine teams next season, most or all of whom wouldn’t be as good as anyone else on the field. That’s depleting the product and providing global players a handout. Making them compete with Canadians for one of six open spots on each team would allow the CFL to gradually become more international over time as players from around the world are able to legitimately vie for jobs. Until they can, the league would – and should – remain Canadian and American. The end result over time would be fewer Canadian players in the CFL as the talent pool from around the world grows and improves. In this sense, it’s no different than there being a lower percentage of Canadians in the NHL now than there was before the arrival of players from Europe. There are still a lot of Canadians in the NHL, just as there will always be a lot of Canadians in the CFL under this model. Ambrosie is fond of drawing comparisons to other leagues and pointing to the positives when international players arrived, be it the dawn of Yao Ming in the NBA or the early trickle of NHL players from Europe. But those players, and every other international player in the NBA or NHL, earned their way into the game. That needs to happen in the CFL, which is why global players must be forced to compete with Canadians to be part of a team, not handed a job despite being inferior to players groomed in Canada. It’s inevitable that some kind of change is coming. 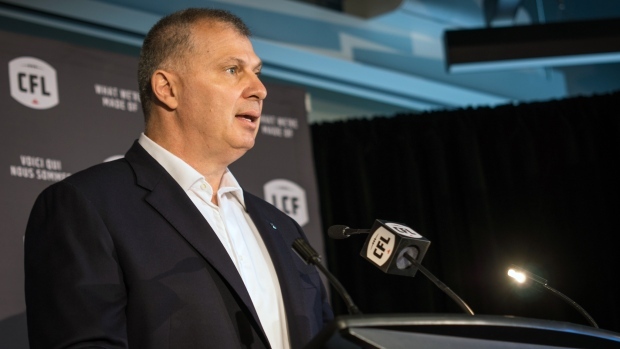 The CFL can’t introduce a bold new vision and expect everything else to remain the same.